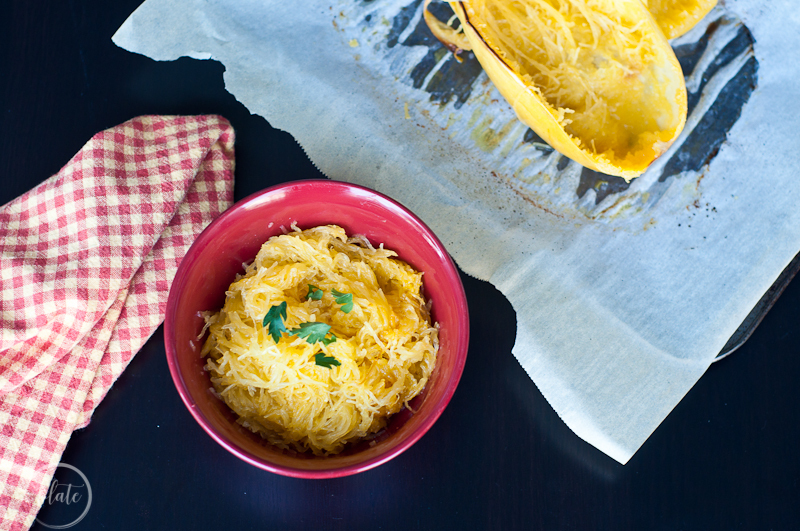 Baking spaghetti squash will have you wishing you’d tried to go noodle-free years ago! Baking spaghetti squash can be done in many ways! My favorite way to cook spaghetti squash is in the oven to give the squash a nice roasted flavor. 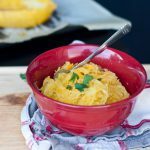 Spaghetti squash has a sweet winter squash taste that pairs well with a rich Alfredo sauce! When my husband and I started eating low carb, low sugar in September of 2017 we had no idea what changes would occur. We were only going to do it for 30 days, just to take control of our cravings. Mine being carbs and his being sugar. We were also noticing a huge addiction happening to our 5-year-old daughter when it came to sugar and I knew if we wanted to get that in check, we had to start with us first. I can’t tell her “no more sugar” while I am eating a doughnut, now can I? We jumped in head first and went cold turkey. Only eating about 20 carbs a day (and for this Irish girl, that was HARD) and NO sugar. After the first week, which we called hell week and are happy to forget, we started to notice awesome results. We had more energy, less brain fog and an added benefit, we started dropping pounds! My confidence started to creep back and we decided to make this a permanent life style. Cooking became even more fun because I was working under a constraint and still making yummy dishes that my husband, parents and friends were gobbling down! So here we are, six months in and loving it!! How do I bake a spaghetti squash? A pro tip I learned is to take your spaghetti squash and puncture the tough skin with a sharp knife quite a few times, on all sides. Then put it into the microwave for roughly 5 minutes (more if it’s a large spaghetti squash). Once it’s done, the skin is so much easier to cut through! If the skin is still giving you a hard time, you can put it back in the microwave for a few more minutes. This is also an indication you will need to bake the squash longer than I specify below. How long do you cook a spaghetti squash in the oven? Slice the spaghetti squash in half lengthwise and take out the seeds. Rub with an oil of your choice, I prefer avocado oil, but you can use olive oil or grapeseed oil too. Place on a baking sheet face down. I use parchment paper so my spaghetti squash doesn’t stick to the pan. A lot of people also line their baking sheets with foil. If your spaghetti squash is small to medium, bake it in the oven at 400 degrees for about 30 minutes or until tender. I learned the hard way that your spaghetti squash will still have a crunchy texture if you’ve got a large squash and you don’t roast it long enough. I would do 45-60 minutes for a large squash. It is important to keep in mind that spaghetti squash continues to cook as it rests and overcooking the spaghetti squash can make it mushy, so don’t do that! Cooking a spaghetti squash whole is definitely easier because there is no prep work! All you have to do is poke holes in the spaghetti squash, put it on the baking pan and flip it half way through. This makes cutting it effortless! Personally, even though this is a way easier method, I don’t cook my spaghetti squash this way because you do not get that yummy roasted flavor, which I love. When you bake it whole, the flavor is more mild and has a bit more of a natural flavor. It really depends on what you’re going for as to how you bake your spaghetti squash. Having a natural mild squash can give you more of an untouched flavor so you can dress the spaghetti squash in different ways. How do you cook spaghetti squash on the stove? Boiling spaghetti squash is another way to cook it. Fill a large pan about two thirds full with water. Bring the water to a boil and gently set your squash in the pan. Cook for about 30 to 40 minutes or until the skin is tender and easily punctured with a fork/knife. I would check on your water level every now and again too. If all the water evaporates out you’ll end up burning your squash. Once done, carefully take the squash out of the water and cut horizontally and scoop out the seeds. Use a fork to release the squash, this will create the strands. You may want to wait and do this once the squash has cooled a bit. Handling it when it’s hot, and slippery from the water, can be a disaster waiting to happen. No body likes to clean up a spattered squash on the floor. 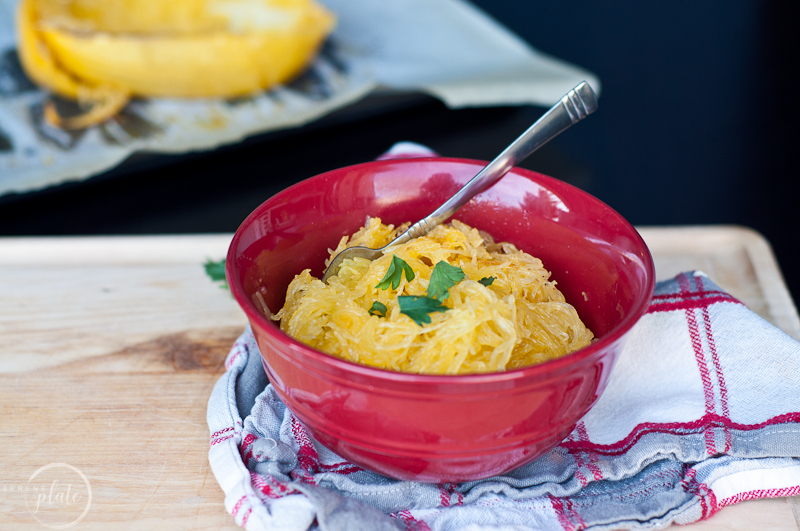 Is eating spaghetti squash good for you? Both spaghetti squash and pasta have low amounts of fat, salt and fiber. But, pasta has 100+ calories while spaghetti squash has only around 20! It is richer in protein and has way fewer carbs! 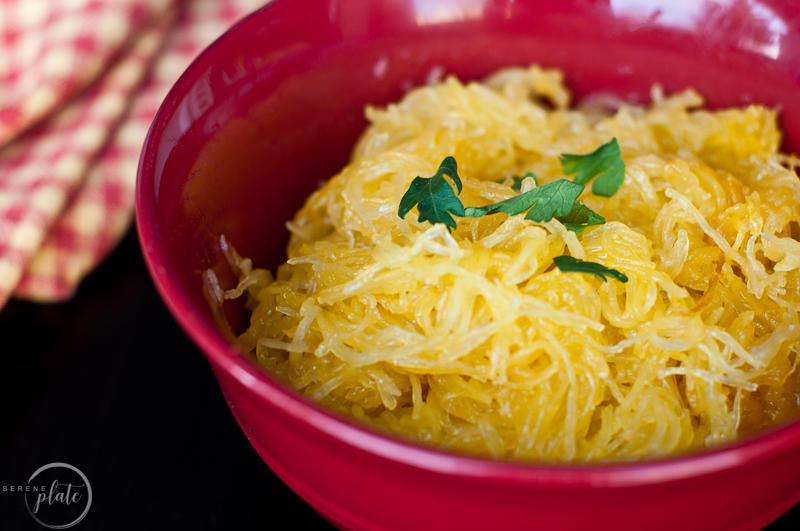 This is why we choose to use spaghetti squash as our noodle replacement. This is why I started eating spaghetti squash in the first place. I needed an alternative to noodles since my husband and I jumped on the keto train and never looked back! Baking spaghetti squash gives me that ‘pasta’ feel while sticking to my low carb low sugar eating lifestyle. You do have to be conscious of your portion size though because spaghetti squash is not necessarily carb free, it’s just lower in carbs than pasta. The recipe below is for a small to medium sized spaghetti squash. If you have a larger squash you may need to adjust the cooking time. It really does depend on what texture you’re going for with your spaghetti squash. Baked spaghetti squash can be done in many ways! My favorite way to cook spaghetti squash is in the oven to give the squash a nice roasted flavor. Preheat your oven to 400 degrees F. and line a baking sheet with foil or place a sheet of parchment paper on it. Puncture the skin with a sharp knife, several times, on each side. Microwave the squash for 5 minutes to tenderize the skin for cutting. Cut the squash lengthwise to expose the seeds. Scoop the seeds out and discard. Drizzle oil on the squash, season with salt and place on the baking sheet cut side down. Bake at 400 degrees F for 30 minutes or until tender. Once removed from the oven, let the squash rest on the baking sheet for 10 minutes, cut side still down. Use a fork to release the squash, this will create the strands. I loved how you illustrated everything to make it so easy for someone who has never made spaghetti squash before. ‍♀️ I also love that you told why someone would ever consider using spaghetti squash over spaghetti. I have used zucchini noodles before on my venture to clean eating and love them, but with your receipt I am excited to try spaghetti squash now.